This is an article I wrote for the JEFFCOWIKI about Belleville so I am also adding it here. 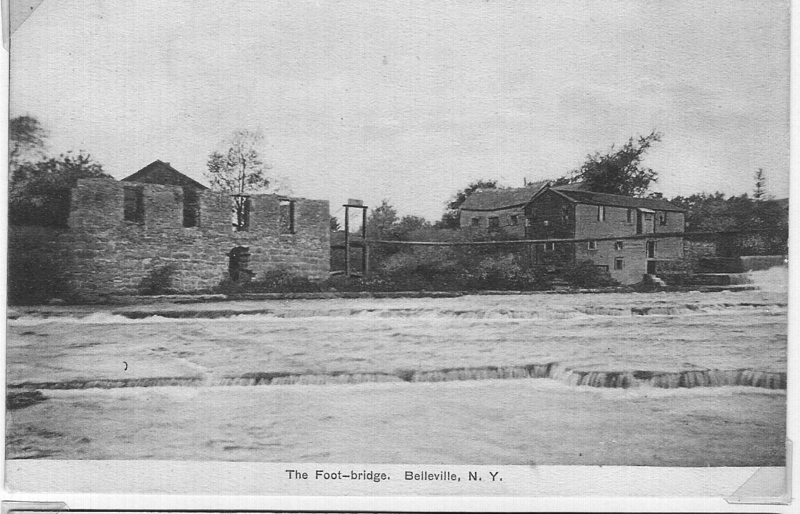 Belleville is in the Town of Ellisburg and was once known as Halls Mills which was named after Giles Hall an early settler. Not until after the war of 1812 was the named changed to Belleville. It is not known where the name came from although there are about four different versions of where the name originated. One is that with the number of schools and churches in the small village that had bells, another is that it was named for a place in Canada, yet another is that it was known to have so many lovely young women living there those the reference of Belle. The first settlers were french and the most likely version is that of French origin. Belle which means beautiful and ville which means village. Belleville was first developed as an agricultural community around 1802 or 1803. To this day it is still one of the best farming area’s in Jefferson County. The land in that area is one of the richest which is believed to be from the low lands that extends as far as Adams and were once covered by a Polar ice cap. When the ice cap melted and the water receded it left many signs of fossils and debris. The underlying limestone & lime rock also made an abundant supply of pure fresh spring water. The Benton Wilkes horses and the Cheshire hogs were originally bred in Belleville. In 1888 a resident of Belleville complied the first “cow census” in the Town of Ellisburg. Belleville is still today a small, quite, pleasant farming town it has never gone over 400 in population. In the early days Giles Hall built a grist mill, saw mill, a wagon shop and the first blacksmith shop. Prior to 1820 Abraham Miller and Rufus Mather also built a grist mill about a mile outside the village, later selling an acre to Oren Howard who opened a chair factory. Harvey Dwight open a cloth - dressing store, Luther Mather had a carding machine place and Samuel Northup later combined them into one business. Matteson Freeman opened a hotel known as the “Central House”, which later burnt and in 1873 I.L.Dillon rebuilt it as a hotel and it became “Dillonback House. Other merchants also included F. E. Wright, harness shop; Keyes & DeBois; Kelsey Brothers; Chapman & Doane, general store owners; Bradley Barney’s notions & jewelry; W. B. Wright, notions and groceries; S. Church , groceries & drugs; L. J. Wait, hardware; Charles Dunham, meats; Mrs. H. G. Walrath and Mrs. Burliegh (Flora) Dickinson, milliners; Dr. E. A Chapman & Dr. S. W. Frame , physicians only to name a few. A furniture and musical instrument builder from Syracuse Mr. J. H. Carpenter moved there in 1861 and operated a furniture manufacturing place and employed eighteen men. He started the Carpenter funeral Home first using a sleigh in winter and a wagon in summer. He was the first in the area, including Watertown to have a motorized hearse. It is today still run by family and is the Carpenter - Stoodley Funeral Home. 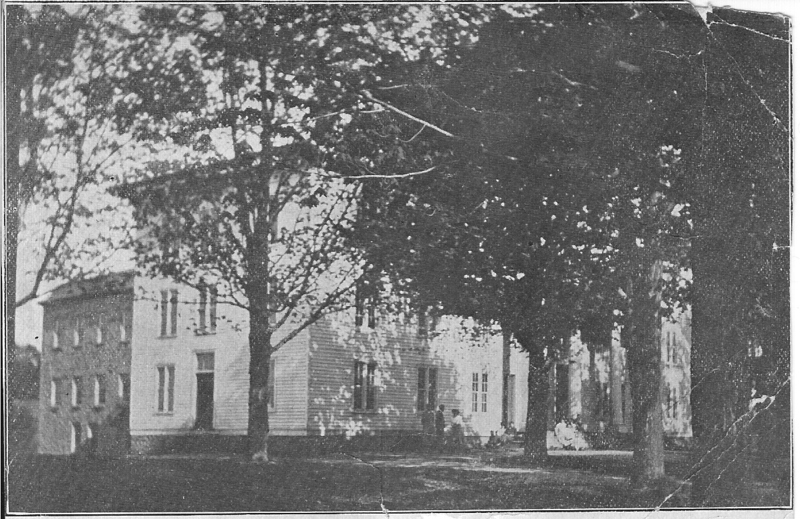 In 1826 The Union Society School opened and today this is where the Union Academy School stands, a well know highly respected school. 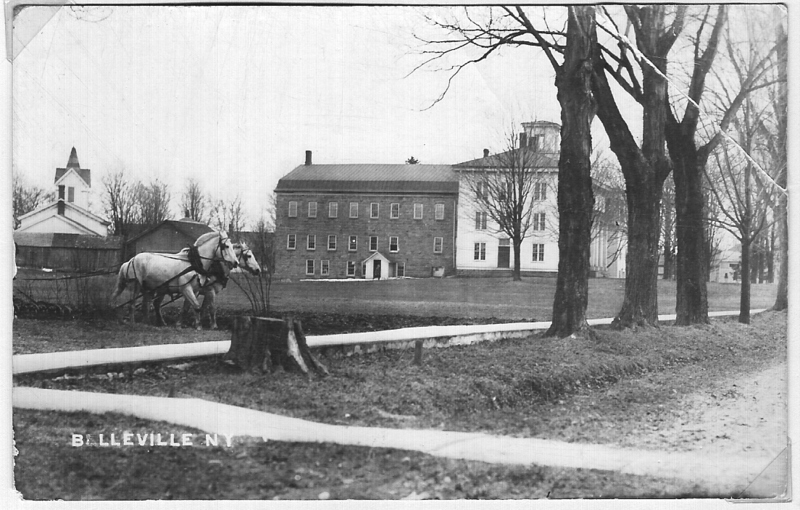 The name was changed to Union Academy of Belleville in 1861. 1853 brought a railroad and butter, potatoes, and cheese were shipped by rail. The Belleville Cooperative Cheese Factory was the largest in the world for years. The village was incorperated in May 1860 and on the 29 of that month officers were elected. D’Alton Dwight, Alexander (Alcander) Dickinson, Daniel Hall, Abner M. Durfee and Calvin Littlefield, trustees; Arthur J. Brown, Clerk; William Pennell, Collins F. Armsbury and Henry Overton, assessors; James E. Green, treasurer; Cyrus N. Rowe, collector; and F. W. Stevens, pound master. A few of the early settlers were Bradley and Joshua Freeman, Giles Hall, Metcalf Lee, Martin Barney, James Benjamin, Jedediah McCumber, Elder Edmund Littlefield, John Hawn, Calvin Clark, and brothers Elias, George and Alcander Dickinson and Ethni Fillmore. 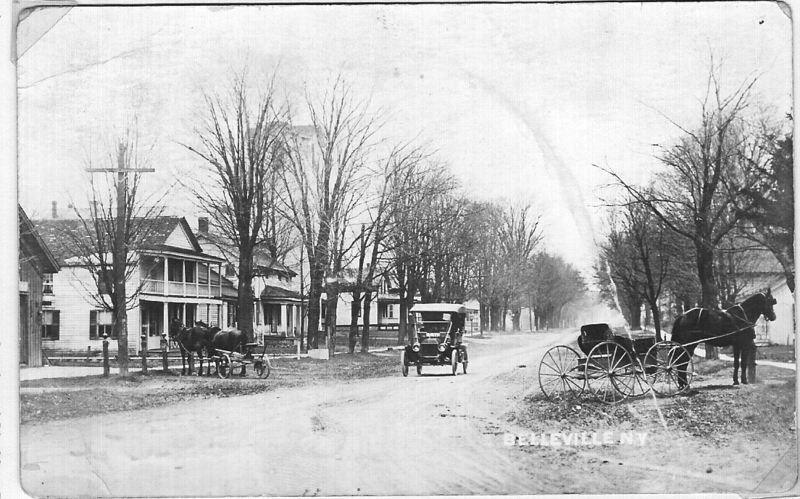 The white house on the left side in the picture with the double porch was where my great grandparents lived. Burliegh and Flora Dickinson.Their picture's are under family photo's. There was a Blacksmith shop next door to their house(doesn't show up in this picture).As a child of about eight my aunt,Flora Hoslton, could remember the sound of the anvil getting closer as her father neared the home. In the first picture on the far left you will see a small portion of the blacksmith shop. The big white building in the center is where the Dickinson family did most of their shopping. 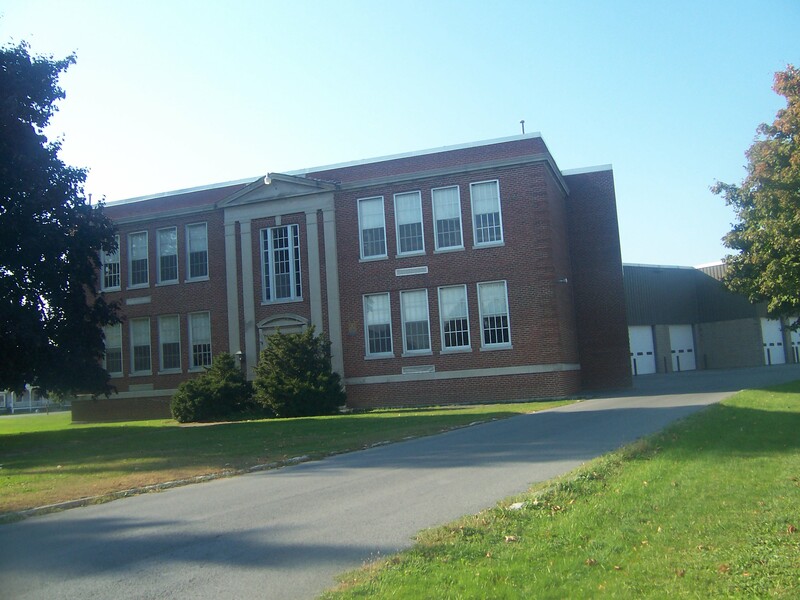 Below is a link to a web site which tells about a pageant given at the school in Belleville,New York on June 24,1925 where my Aunt Flora Dickinson, her brothers (my dad included) and my mother went to school. My aunt was about 15 at the time.As you will see she played a memory sprite. 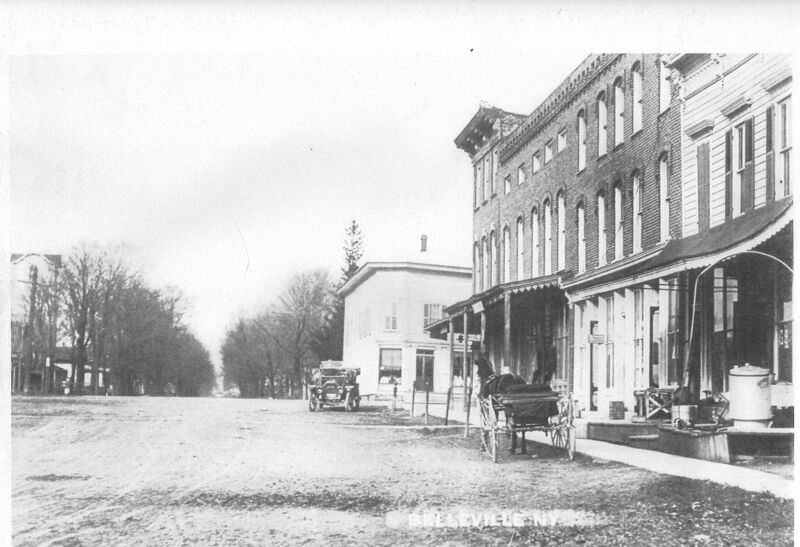 More old picture's of Belleville. Will label them soon. 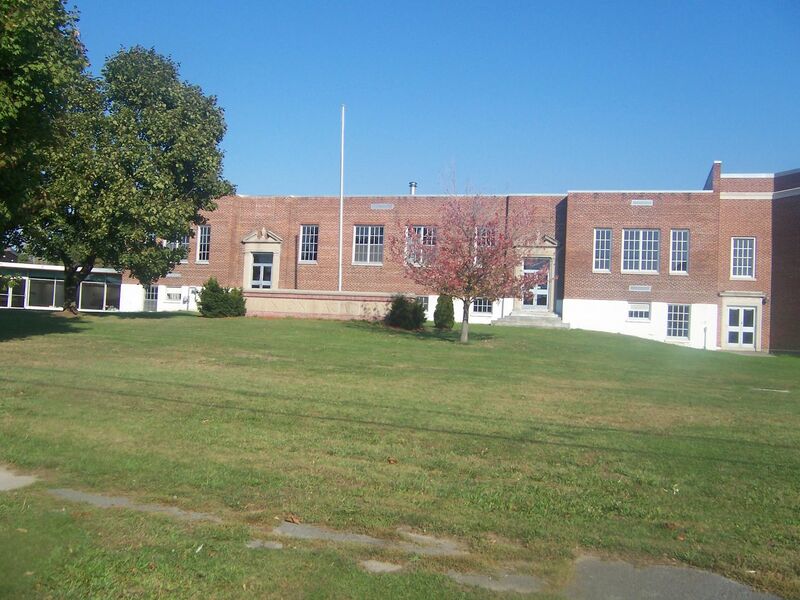 The next two pictures are of the Belleville Academy.The first one is the front of the school and then the side view. 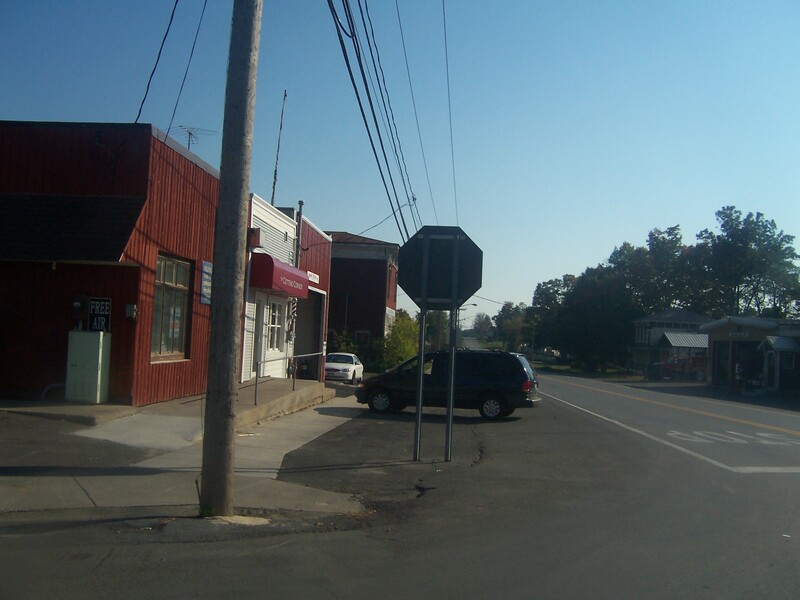 Then I turned and with my back to the school took a picture of the main Street. This next link shows my Uncle's Diploma he got in June 1922 when he graduated from Belleville Union Academy school. It doesn't show up well and instead of resizeing it I will try to get a better picture when I can. This page belongs to Thelma Moye.